Summer is HERE and so is summer holiday season. For the next few weeks I will be dishing out tons of fab beach reads for you to pick up and page through – and of course I’ll be giving them all away! 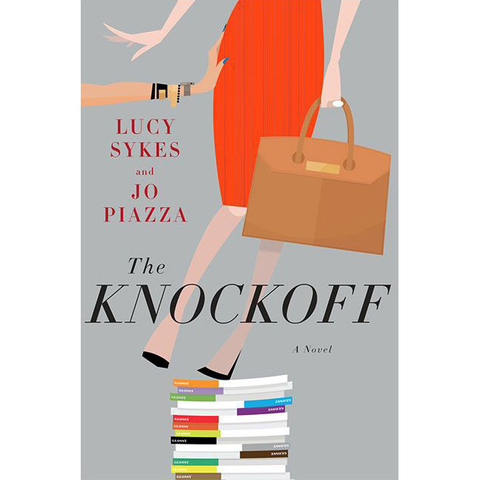 Today we’re getting started with a fun and fashionable book that flips The Devil Wears Prada motif on its head. What’s The Buzz? : It’s been awhile since the fashion industry had a juicy book to chew on. While The Devil Wears Prada is perhaps the most famous example of the notoriously cutthroat and salacious magazine world (and indeed it’s name checked here), The Knockoff offers a fresh new riff on this world, one that is a twist on what the DWP was all about and is in line with our increasingly connected world. What’s The Plot? : Imogen has been gone from her job as a respected editor-in-chief for Glossy magazine for just six months after a bout of breast cancer – but it feels like she’s been gone for six centuries when she returns. Her former assistant Eve has returned and taken up a surprisingly senior role, spearheading the launch of a new Glossy app as the paper and ink edition is left in the dust. Imogen feels completely out of sorts as she is pushed into more of a figurehead role and forced to adapt to the office’s new techie ways – cell phones at meetings, selfies at fashion shows, and being obsessed with being plugged in. Imogen is careful to toe the line between propriety and putting Eve in her place – but as Eve’s moves to take over Imogen’s former life become increasingly vindictive, Imogen has no choice but to fight back. What’s The Connection to The Devil Wears Prada? : As I mentioned above, the two books both take place in this fashionable yet fictional world (Miranda Priestly is name checked, as is the book title, but both in a fictional sense). Yet the books DO share a connection in that in many ways, The Knockoff sort of envisions what would happen if the tables were turned – if Miranda were on the outs and Andy was the new star. It’s an interesting concept, made even more interesting by the fact that the villain and hero roles are switched. Eve is insufferable and gives a bad name to millenials everywhere, to the point where it’s almost comical, again drawing a line between her and Miranda, the ultimate uberbitch boss. Imogen, while occasionally perhaps a little too good to be true, is the picture of decorum and effort and gives you someone to root for. Is It Funny? A Drama? : The Knockoff falls somewhere between the two. It’s most accurately in the ‘chick lit’ category as the book depicts rather extreme situations that could veer to funny. But the bulk of the story centers at the cat and mouse game between Imogen and Eve. The story largely focuses on Imogen, but it does give you glimpses into other characters’ lives, including Eve (who is just as deranged as Imogen suspects, based on the brief spells we spend in her head), as well as Imogen’s assistant, Ashley. Imogen’s actions moreso inspired smiles from me for how clever she was – despite her doddering ways on the interwebs, she’s one sharp lady! Who Should Read This Book? : Naturally The Knockoff will appeal to anyone with an interest in the fashion and magazine industry. It hits all the bases like Fashion Week, but it also weaves in how much the technology industry is really influencing the fashion one. One thing I will note is the book isn’t very kind in its portrayal of younger women. While you can take it as an exaggeration of millenials’ bad habits, I suspect a few younger readers (i.e. teens) won’t appreciate it too much! But the cool thing is, with Imogen and Ashley on the ‘good guys’ side, you’ve got two age ranges of women to cheer on, so it’s not like all twenty-somethings are painted with the same bad brush. And of course, fans of The Devil Wears Prada will want to snap this up. 1) First & foremost: you must be a subscriber to the Canadian Gift Guide to enter this giveaway. It’s as simple as finding ‘The Gift of Gab’ box in the righthand column and dropping in your email or clicking follow. Then, tell me in the comments below by July 13, 2015 – why are you interested in reading The Knockoff? 2) Entries are limited to one per person / per email address / per household (or more if you score bonus entries). A random draw will be conducted on or around July 14, 2015 to select the winner, who will have 48 hours to respond before another winner is chosen in their place. 4) Bonus Entry: Follow Random House of Canada on Twitter, tag them and me (@cdngiftguide) in a Tweet about why you want to read this dishy book! Post a link to your Tweet below in a separate comment to earn yourself an extra entry into the draw. As a former dressmaker, I am always interested in fashion and the fashion industry. Always looking for interesting reads. As a fashion design graduate, there are many B’s out there. Design aren’t always what make it, it’s your attitude that says a lot. Should be an interesting chick read. Summer here I come, I have a good read! I am always looking for something new to read. This looks fun! I’d like to read The Knockoff to learn what goes on behind the scenes of fashion, and because it would be a great summer read. Would love to read The Knockoff because I have always had a secret dream of being a magazine editor! Will never happen, so can enjoy it through fiction! I enjoyed the Devil Wears Prada. This sounds fun. I think that this book would be very interesting to read about fashion and also be a fun summer read! I read anything & everything but have not read any fashion books yet, so this sounds quite interesting. I have a keen interest in fashion so would love to read this book. LOVED TDWP and would love to read another book like it! Cool concept. I love a good, fun read. I really enjoyed the Devil wears Prada, and this one sounds good too. This looks like a fun read, and I can always use more fun reads!